WOW! 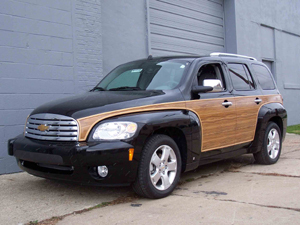 The HHR Woody “Wood” Kits are the coolest re-styling package for your HHR ride! The “Woody ” Kit is designed to replicate the early woodys with a “new”modern style. 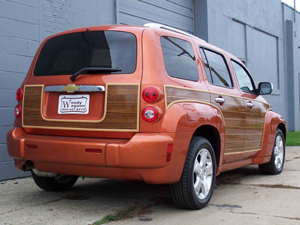 Unlike other woody kits the “wood” extends around the top of the doors and hatch area to blend in gracefully with the overall design, complementing the overall look and feel of your HHR. Our “Woodys ” have won numerous awards for us, and our customers, including “Best in Class” at the prestigious 2001 Detroit Autorama! The attention and “thumbs up” it receives on the street makes every day a car show! Manufactured from high quality materials, Woody Wagoon’s kit durability is exceeded only by their genuine good looks. The “wood” panel material (simulated Cheyenne Teak) with an additional UV Laminate and the “wood” outer edge trim (simulated Santa Rosa Oak) is manufactured to ISO 9001 standards. Our application specific 3M attachment system and quality materials allow us to give you an unprecedented three year guarantee on our “Woody” Kits. This is not just another “graphics” kit, or expensive, maintenance intense, “real” wood. The "Cheyenne Teak” panels are a durable vinyl with an extra UV laminate overlay, and the outer “Santa Rosa Oak” trim is a proprietary raised quarter round plastic molding that covers the edge of, and rises above, the “Teak” panels. This gives your HHR a true 3-deminsional light and dark “wood” surface just as the original Woody's had. All components are shipped ready to install. The detailed instructions are designed for the first time installer and consist of two manuals, text and photo, showing all the details of the installation. Also, tech help from Woody Wagoons professional installers is only a phone call away. Home enthusiasts, including an 80-year-old grandmother, have installed hundreds of our kits! This is an all day job for the first time installer. Kits Available For the 06-09 HHR! Kits Available For the 07-09 HHR Panel Wagon! Please Note: All Woody Kits Are Cut and Made Specific to Each Order and Are NON-REFUNDABLE.